We see clouds nearly everyday. They float in the sky above us and block out the Sun. Sometimes clouds are white and puffy. Sometimes they are dark and cover the entire sky. Different kinds of clouds can mean different kinds of weather. Meteorologists study the formation and make up of clouds to understand the weather better. Clouds are made up of tiny droplets or frozen crystals of water. Most clouds form as warm air rises in the atmosphere and cools down. All air contains some water vapor and warm air can hold more water vapor than cold air. As warm air cools the water vapor turns into tiny droplets of water or ice. As more and more air cools down, more droplets form and they eventually become a cloud. Clouds are often described by the level or elevation where they form. There are high, middle, and low level clouds. High - High level clouds form above 20,000 feet. Because it is colder higher up, these clouds are mostly made of ice crystals. High level clouds usually have the prefix "cirro" or "cirrus" in their name. Middle - Middle level clouds form between 6,500 and 20,000 feet high. They may be made up of water droplets or ice crystals. Medium level clouds usually have the word "alto" in their name. Low - Low level clouds form below 6,500 feet. They are often composed of mostly water droplets. Low level clouds usually have the word "stratus" in their name. Vertical - Some clouds are vertical clouds. These clouds are very tall and may span many of the cloud levels. Vertical clouds usually have the word "cumulus" in their name. 1. Cirrus - Cirrus clouds are high level clouds that are thin and wispy. They appear during good weather. 2. Cirrocumulus - These are high clouds that look like tiny cotton balls bunched together. 3. Cirrostratus - High, flat clouds that might cover the sky making it appear overcast. These clouds signal that it may rain in the next day or so. 4. Altostratus - Medium level clouds that form a dark gray covering. Usually they are a sign of rain. 5. Altocumulus - Middle level clouds that are small, white, and puffy. 6. Nimbostratus - These are thick, dark gray middle level to low level clouds. They usually bring rain or snow. 7. Stratus - Stratus clouds are low level clouds that are flat and tend to cover much of the sky. They are gray in color and may produce light rain or drizzle. 8. Stratocumulus - These are low, puffy, and gray clouds. They may produce a little rain and can turn into nimbostratus clouds. 9. Cumulus - Cumulus clouds are low to mid-level clouds. They are big, white, puffy, and beautiful clouds. They usually mean good weather unless they grow really tall and turn into cumulonimbus clouds. 10. Cumulonimbus - Cumulonimbus clouds are very tall clouds that span all the way from low level to high level. They can cause violent thunderstorms with heavy rain, hail, and even tornadoes. If clouds are made of water, then how do they float in the air? It turns out that the droplets of water are very small, but they have a lot of surface area that keeps them from falling. Sort of like a spec of dust that you see floating in the air. However, even being very small and light, they would eventually fall if it wasn't for the warm air rising below them keeping them up. Remember that clouds form when rising warm air cools. This warm air helps to keep clouds floating. A cloud that forms on the ground is called fog. Some clouds you see in the sky might be from airplanes. These are called contrails. High level cirrus clouds may travel at speeds up to 100 mph. 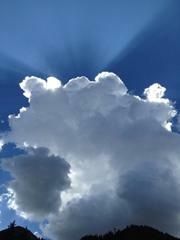 Even though clouds float in the air, a single cumulus cloud can weigh hundreds of tons. Other planets with atmospheres have clouds including Venus, Jupiter, and Saturn.